Last week Amanda and I hosted a Chocolate and Painting party, she brought the chocolate and I brought the painting - oh what a combo! That was my version of heaven: 14 bars of chocolate, painting and surrounded by great people. 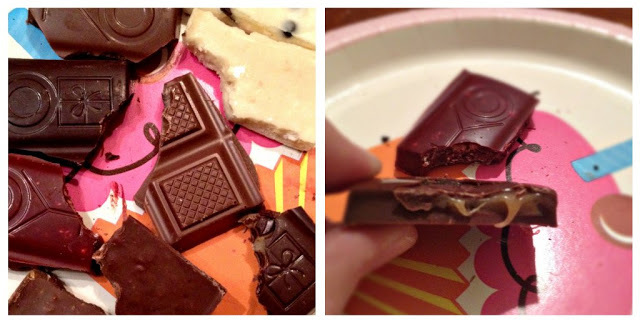 Amanda posted her review of the Chocolate Taste Testing Party last week. 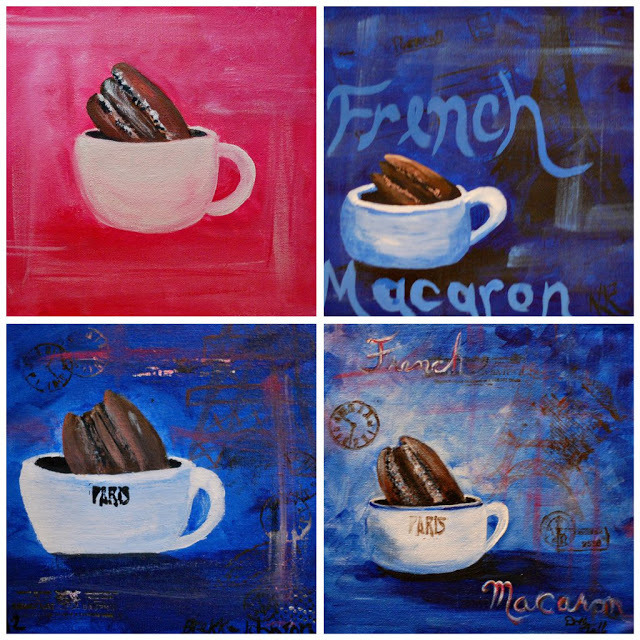 It took me a bit to put together my post because, I've put together an instructional video where I paint the French Macaron painting, so you can have a chocolate and painting party you can too! But before the video, I have to show you why this party rocked! Amanda started off with Cold Stone Creamery Hot Chocolate topped with French Vanilla Marshmallows to warm us up - it was really cold outside that night! We stood around chatting for a while enjoying the warmth of the hot chocolate and then we sat down to this beautiful array of chocolate. We all came hungry and it was a good thing too! Um, Chocolate - shoot ya! Let's Party! There were 5 of us girls and the funny thing was, when we sat down and looked at the spread, our initial thoughts were 'maybe we should've eaten before we came over'; each chocolate bar had 6 chunks, so one for each and one left over for Amanda's hubby, who popped in occasionally for a refill of chocolate. Didn't seem like much, but by the 7th bite of chocolate I was getting full and giddy from the chocolate rush. We each took a chunk, took a bite and tried to let the chocolate melt in our mouths so we could really taste the difference in each. It was amazing: I am not a fan of Toffee (meaning I won't eat it :) ), but the Dylan's Milk Toffee Crunch was chocolate buttery crunchie goodness - I was shocked! After the 5th bar, we decided to paint for a bit. Here is my painting crew: Amanda, Brekke, Dolly (my Mom), and Kim. The skill level ranged to never painted before to my Mom who has some China pieces she has painted in museums. We had music from the broadway show "Wicked" playing in the background and you could hear the brush strokes. As you can see, everyone was very focused, not tense, though - one of the ladies said "this is therapeutic" another "this is so relaxing". When we got to a certain point in the painting we took a chocolate break by the fire where we made s'mores. 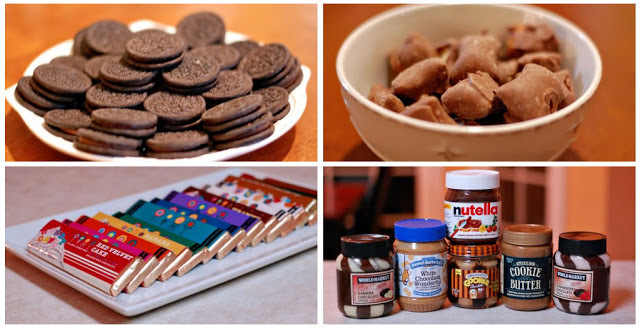 The s'mores were different than what we did growing up, you know gram crackers, Hershey chocolate bar, and marshmallows...instead we had Ritz Crackers with various spreads. My absolute favorite spread was the Cookie butter, which is the same as Biscoff Spread (I took a picture so I would remember and buy it). JUST YUMMY!!! Everyone's painting turned out unique and reflected their personalities - it is just neat!! 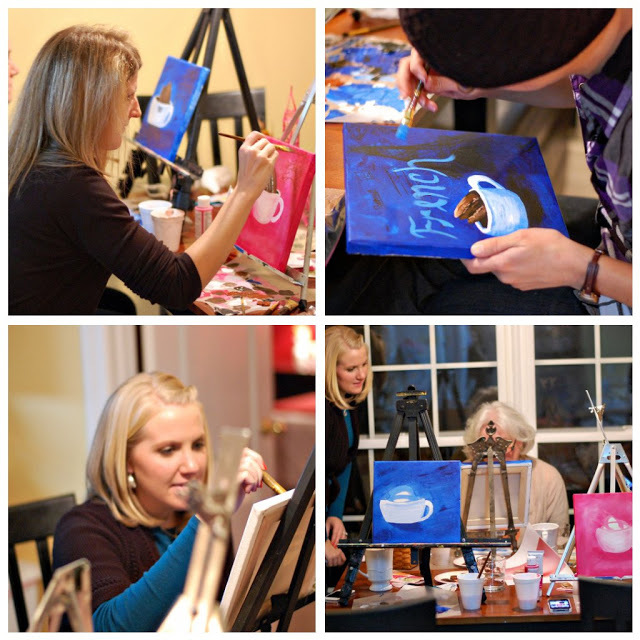 From top left to bottom right: Amanda's (who never painted before), Kim's, Brekke, and Dolly's. Note: if you are looking for inexpensive paints that are excellent for group painting go to or call Joann Fabric and ask for DecoArt's Social Artworking paints - they work just as well as Daler Rowney paints in this picture. In the video below, I prompt you to pause to paint that step and for breaks to have more chocolate so you can let the paint dry. This is my first painting video; please let me know what worked well for you and what didn't. Next month we are painting cupcakes! I hope you all enjoy painting a French Macaron! I'd love to see a picture of your painting.